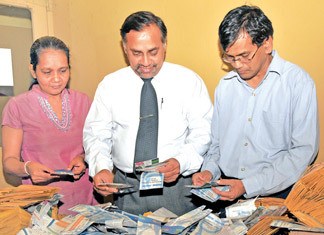 Picking the winners ... Sunday Observer staffer (from left) Sureka Galagoda - Deputy Editor, Business. Waruna Mallawarachchi - Head of Corporate Relations - Associate Newspapers of Ceylon Limited and Pramod de Silva - Senior Associate Editor, Sunday Observer going through the coupons in picking the winners of the Sunday Observer - Mobitel - Sri Lanka Telecom Most Popular Schoolboy Cricketer of the year and Most popular outstation schoolboy cricketer of the year contests on coupon No. 6. OBSERVER-MOBITEL AWARDS: Ananda College spinner Sachitra Perera took the top spot once again, polling 15,274 votes and Royal skipper Ramith Rambukwella is not so far behind at number two with 15,243 votes at the end of count number 6 in the Observer/Mobitel Most Popular Schoolboy Cricketer All Island Contest 2011. In the Outstation category, Chatura Dilshan of Maris Stella College, Negombo climbed to the number one position polling 7,871 votes and Sanjika Ridma of St. Servatius’ College, Matara remained at number two while Dushan Vimukthi of Royal College, Panadura was pushed down to number three after occupying the number one spot last week.